ReFashionista on GMA!!!!! What the WHAT?!?! I have some really exciting news, folks! 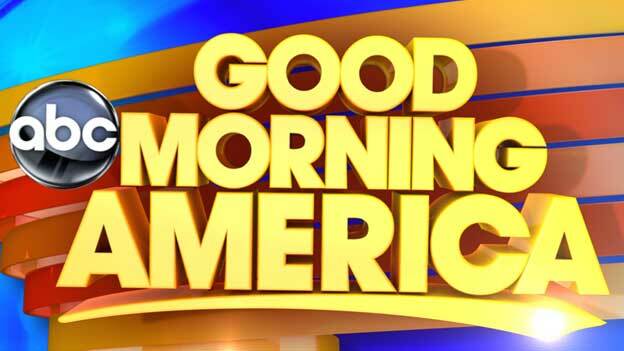 I’m gonna be on Good Morning America on Friday, July 18!!!!! I’m NOT KIDDING. It’s really going to happen. I can’t wait to chat about my refashions and do a surprise refashion LIVE on the show! I hope you’ll all tune in and check it out! Wow! How cool is that? Congratulations! You deserve to be there, congratulations!! I am so happy for you! I will be watching!!! I have always known you were bound for global stardom. Well done, I am so pleased for you. Awesome! I hope you really help people get out there and refashion some clothes and help slow down the overwhelmed clothing market a bit and give money to some really good causes. Great work! That’s so awesome! I am excited for you!!!! Congrats! So happy for you!! Stopped reading my emails and immediately set my DVR! You’ll be great! Mmm hmmm! As soon as you made that one shouldered masterpiece out of those big legged britches, I knew you were on your way up! :-) I’ll be cheering from Texas! Congratulations!!!!!!!!! And to think, we knew you when! Gotta set that DVR tonight. Wonder what that guy that didn’t understand why this blog was so important to you is thinking now??? Remember him???? Eeeeee so exciting! Can’t wait to see what you refashion! That is so exciting!! Congratulations! You’ll do just fine! Plan on being nervous for the first 15 seconds and then you’ll relax because you are going to talk about what you love to do! I love your Blog! Fantastic! Do you know the date and time yet? I just found your site yesterday! Great news about your upcoming appearance on Good Morning, America. Congratulations! Your style is amazing! You make me feel like I could turn Goodwill finds into treasure too. Thank you for all your tips! Ahhhhh so exciting!!! Setting dvr now! Finally! Can’t wait for everyone to see you work your magic. You’re going to blow them away. Can’t wait to watch! I’ve set my PVR so I don’t miss it. Congrats! OMG – wouldn’t miss it for the world! DVR has been set! Congrats! I will be watching. By the way LOVE the gaucho remake! Well, it’s about time mainstream media got hip to you! Congrats! I can’t tell you how many times I’ve stood in front of a mirror in a thrifted find and wondered, “What would the ReFashionista do?” You inspire me!!! YAY! Congrats! You really deserve it. I’m doing my first refashion and I have been thinking about you the whole time…not in a creepy way. ;-) I will be tuning in. That’s awesome, I look forward to watching the show!! Good luck!! Now that is KOOL!! CONGRATS! I’m so super happy for you!! I show my daughter all your refashions because I think your so super talented, I’ve even shown my hubby. I’m happy that the rest of the world will see how talented and creative you are. Your pieces are worthy of showing off. Congrats! Cheers, congrats, and a round of bubbly for the room! Knock em dead kid! Congratulations and good luck (not that you need it)! SO EXCITED FOR YOU!!!! Just convince yourself that you’re not nervous, it’s just excitement! Can well believe it, Congratulations! I’m an avid follower..but live in Germany, will there be a way to watch it afterwards?enjoy yourself! Thanks Edward it would be a real shame to miss it! WHOO-HOO!!!! You deserve it – I’ll be watching! So happy for you! Wonderful to see all the hard work pay off! Yay! Congrats! Can’t wait to see you on TV again! Just set tv to record it. So excited for you girl! They’ll be lucky to have you! Congratulations. That’s great – I thought you should be on TV with that talent! Congratulation!!! Can’t wait to see what you do. Congrats! Having a great time! This is so exciting! I’m excited for you!!! I’ll be sure to tune in. I’ve never watched GMA before but for you, I’ll be sure to watch. Just be yourself, you’ll shine! Very cool! But now I have to get up early.Well worth it though! Have fun!!! Congrats!!! You GO, you funny creative girl! That is AWESOME! Congratulations. PS: I saw an entry about you on BuzzFeed from a couple of days ago too. Hey! Laurel from the Orange Dress Reader ReFash in March here. So happy for you! You are an inspiration and deserve great things. I will be watching! Congrats on the recognition you are getting. I am glad I was with you back in the early days. Go!!!!! Happy for you. I will DVR GMA so I don’t miss this super opportunity for you. Love your blog. Congrats! I can’t wait to see you on tv! That is so awesome!! Can’t wait to see you! You are the best! Awesome! You go girl! I’ll be sure to tune in. Funny how you can root for a person you have never met! Thrilled for you. Hi Jillian, found a link to your blog on 22words a week or so ago and I read every post from front to back. Your refashions are inspiring, love your color compositions and marvel at all your shoes! Congratulations for appearing on GMA, you will knock them dead! I bouhgt the S.E.W. book you recommended in a post and I’m buying myself a sewing machine! I can’t wait to find mummuus and old lady dresses to remake! I have recently become a BIG fan of yours. Congrats!!! This is AWESOME news!!! Enjoy every minute!! You deserve it!! I’m so excited for you. You create change one person at a time. Friday you could change millions! Congratulations. Fantastic!!! Way to go, Jillian – I’ll be watching! wow! that is awesome, I will definitely watch. congratulations, you have come a long way baby!!!! Hey congratulations! I was wondering if I could post something about your blog in my column (in spanish), I ussually talk about health, but I want to do something about ecofashion, would that be ok? Will you be posting an imbedded link for it later? Apparently due to the licensing, we can’t view it up in Canada. GRRRR! Long time fan! They’re fortunate to have you as their guest! You deserve the exposure!! Congratulations, Jillian! It is wonderful to hear you will be sharing your unique take on things to a national audience. Just pretend it is karaoke night (sans margarita ;-). Remember to have fun and enjoy the hair/makeup pre-show (not that you need it, but I am sure it will be fun). Can’t wait to see what you whip up for America. Congratulations! Well done and well deserved. I”ve been following you for a few years and am always amazed by what you can do with your “finds” and your sewing machine. Best of luck and keep those refashions coming! Omg! So exciting!!! DVR is set!! Good luck! Congrats!!!!! That is super cool ! I am already a fan, but so glad more people will get to see the rad stuff you re-create! Amazing!! Congratulations!! :) Ha! Now we can all use the line “I knew her when…” now that you are getting famous on us! Way to go girl! Yeah! So excited to hear you in real life instead of pretending you’re talking to me via your blog! Way to go!! Congratulations! I am so not a morning person, and after a sad sigh I realized I can tape it and watch it when I get up!!! Hurray! So excited for you!!! Your blog has really helped me get out of my shell and start enjoying my clothes more. I love looking at them and seeing something new thanks to you! I cannot wait to see you on the 15th! That is great! I’m so happy for you! Do you know any place where I can watch this online? I live in the Netherlands so unfortunately I am not able to tune in on GMA. well done you deserve the recognition. Congratulations!!! SO excited for you. Can’t wait to watch! Congrats! Love your refashion inspirations. That is CRAZY awesome! Yay, you! Yay! I am really excited for you! Congrats! Can’t wait to see you in the spotlight! How exciting! This is two Friday’s in a row that someone whose blog I read is on GMA, what are the odds? So inspired by your blog. I spent waaaaay too much time perusing one day. Good luck tomorrow! So proud of you girl. You deserve. This is so exciting! I watched you on both Rachael Ray and Good Afternoon America and you did so awesome on both of those shows! You have great stage presence (yay for Theater!) and I’m excited to see you in action again. WOW! This is so great for you! I’ll tune in tomorrow. You ROCK! That is incredible! I’ll be watching. Good Luck! That’s so awesome! Congratulations!!! How exciting!!! Congratulations! I follow you from Spain, i hope I can see it online. Besos! I’m in Canada and I was wondering the same… hopefully this will work for us! You’ll be wonderful! Good luck! We’ll be watching (along with another couple of million people – no sweat.)! Congrats, dear! Way to keep at it. I’ve been following for some time and appreciate all the hard work you’ve put in! So exciting! DVR set and ready for the fabulous you! Good luck! Awesome! That is amazing and you have SO earned the exposure, Jillian! Cool! Will try to catch you. OMG I’m so excited for you! I’m recording since I’ll be at work! Good luck! Wowee! It seems that just a few weeks ago, you were struggling with your creativity and NOW your blog’s gone viral and you’re on a major TV show! Your mojo is definitely back! I’d say that your mystery man is a good luck charm… :) Seriously, congratulations! You are awesome! btw all serious “creatives” or “artists” struggle with creativity and inspiration on a fairly regular basis. That is part of the whole process. Please, post the link for your foreings fans hehehe. Congratulations! And Thank you, for sharing your post with such fun details. Looking forward to your continued success and inspiration. Watching! Sounds like you should be on any minute now. Palomita, try ABC.com later to see if you can see the video. If not, you may be able to get the ABC app. The show is Good Morning America. I’m such a fan. My ScrapStitching.com site is all about making things out of other things. If I had her body, I’d be making clothes out of castoffs in a New York minute. I am witching it right now! Very proud of you my fellow South Carolinian. You Go Girl! I am watching it right now! Very proud of you my fellow South Carolinian. You Go Girl! You were fabulous! Cool as a cucumber! Congratulations! Your segment on GMA was fabulous. What you do is amazing and inspirational. I love the idea of repurposing just about everything, but only if it results in beautiful or practical items; you accomplish both very well. You rocked it!!!! It was so fun to see you on tv!!! You will find Jillian’s performance at this link, in case you missed it like me. Excellent! Thanks Mea. Jillian was so very poised. I am sure there will be many new members of the blog family after that wonderful segment. You looked great on TV. Would LOVE for PBS to create a show from your refashions. I didn’t get to see it when it first aired, but I found the video online (same spot I think Mea posted). Awesome work, Jillian! You definitely inspire me (although, my refashioning has taken a hiatus because of baby duty). Congratulations Jillian! Just saw you on GMA – very cool! You were awesome! Love your designs. Congratulations!! just watched your piece on GMA and you were just as I thought not only bubbly but a natural too! you should be on TV regularly!!!! Congrats! You’ve inspired me to start my own blog, and show people what can be done with their old clothes. I was hoping I could share your GMA video. Would that be alright? I have been following your blog for about 10 months and get so inspired!!! Especially love the tip to dye – never would have thought of that. And what an awesome piece on GMA today! Congrats!!! Yay for you…. I stumbled onto you blog a few months ago!!!! I’m a definitely a fan. I can sew….. 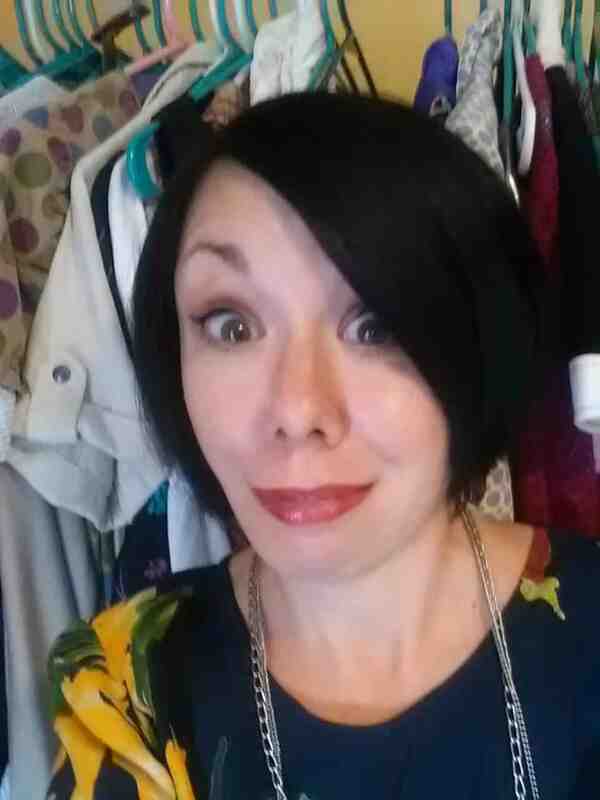 So since stumbling onto you blog I’ve been thrifting and I have a huge stack of *old* fabulous pieces to refashion! Thanks for making it look so easy. It’s so great to see your true personality on the show. I just watched the video. That was so awesome! You’re as cute as your refashions! I just saw the clip online- it was great! You are soooo inspiring. Keep bringing the awesome!! Is hard to get (to watch) the video outside the U.S. :( . Is blocked everywere! Well, I am hoping everything was fantastic!! I remembered to set my DVR & I watched!! You were awesome! You were pretty poised for someone who doesn’t spend all her time on camera. You looked like a pro! Congratulations! I hope you get a gazillion new readers out of it! Recorded the piece and just now saw it. You are a wonderful inspiration. Thank you. When one’s weight fluctuates due to medications it is nice to know something beside buying new clothes can be done. I have yet to brave the re-fashion but will be doing one this weekend. I’ll send pics to you by e-mail. Congrats. You deserve it. I NEVER watch GMA, but when I read you’d be on, I made an exception. It was such fun to watch you doing what you do best: Magic Makeovers!! You looked like a pro! Someone should give you your own program!!. Omg I recorded it to see you! You speak and move and still make awesome clothes!!! I missed it! Do you think you’ll post the video when it comes available? I set my DVR and watched it – I especially liked the one you dyed. When I’m thrifting if I come across 100% cotton white tops – t-shirts or blouses – for a good price, I get them so that when I get a hankering for a certain color to make an outfit, I can create it. I hope they have you back again on GMA! Saw you on GMA – I am a new Fan!! Love, love, loved the ideas, the tips & tricks – now to learn some sewing techniques and use my imagination! I watched the video of you on Good Morning America! I have been reading your blog for some time now… But only recently subscribed (I have a phobia of getting too much email…). You did such an amazing job! It was one of their better segments in the lifetime of the show! Bless you in your future refashioning endeavors!!! I am sorry that I missed it. I will look for it on Hulu or youtube. com. Life has been happening somethings have taken the back seat. I am sure that you did great and knocked it out of the park. I have been reading your blog for awhile now and I love it. I have taken hubby’s slacks and made a skirt out of them for me. ;) Keep up the great work my kiddos and I like looking at the cute refashions that you do. Awesome job on Good Morning America! You looked very comfortable on camera, were clear and to the point on how much can be done with thrift clothes. You are an inspiration to me and right now because of your segment on GMA I’m working on removing sleeves off a dress. Whirrr! You are so fabulous on and off TV and definitely not frumpy even before, just those dress… Your my hero..